As a former journalist, I have a passion for research, current events and packaging information. When I earned my second bachelors degree, I did it to show my daughter the value of education. I wanted to start grad school, but I didn’t know how feasible that would be with a job, a child, a household and several volunteer commitments. So I committed to a new undergraduate career instead. Cheaper & faster than grad school. A way to test the water. A way to increase my academic credentials to better match my professional experience. But I do really want my Ph.D. I applied to a prestigious program last year and did not get in. The whole process taught me a lot and when I reviewed it this winter I talked more in depth with my former advisers. Here’s the thing about advisers: you have to consider their advice within a framework of who they think you will be. I’ve discovered that my former professors have visions for me that don’t necessarily match my goals. Frankly, some of their plans are quite flattering and sometimes overwhelming. 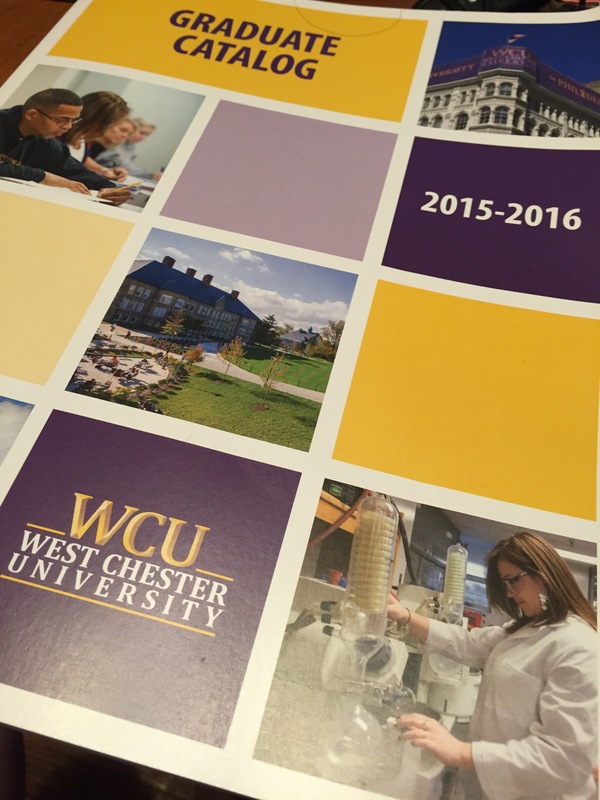 One adviser had suggested the MA program in history at West Chester University. At first I didn’t take him seriously because they don’t have a Ph.D. program. They sent me an email, coincidentally, advertising a grad school open house. Here’s the kicker… If you attended, they waived your application fee. And then I reviewed their faculty. I noted at least five professors whose interests intersect with mine. The program was flexible, part-time or full-time, affordable and has some scholarship/graduate assistantship available. At the same time, I was trying to contact another prestigious school about taking a class in their African studies department this fall. They had a professor who might have an interest in East Africa that might suit me. It took two weeks to get an email that told me to call them or come to one of their “walk-in” events. The email merely asked if the class I wanted to take could be enrolled in as a non-matriculated student. Frustrated by the prestigious school, I emailed West Chester. I received a delightful response the next day that encouraged me to contact anyone in the department. I also got an email from the person who would be hosting for the history department at the open house. And then the open house happened. Wednesday August 12. The graduate coordinator was enthusiastic and portrayed the strengths and weaknesses of her department. She thought I might like a class they were offering this fall, suggesting the professor would be a good fit, and indeed it was one of the people who intrigued me originally. I came home. Thought. Chatted with friends. Worked. On Monday I entered my name into the system as a potential non-degree student in the history graduate department. Monday night I received a student number. I also received an invitation to the history meet-and-greet today. I declined. It’s a 90-minute drive one way. Tuesday morning I initiated my account and went into the registration system to see what I needed to do to gain approval for the class. Nothing. Just click. So I did. Turns out classes start next week. I have gone from floundering to enrolled in a graduate level class in less than a week. Provided this works out, and I suppose paying tuition is the main next step, I will go from undecided about my next step to sitting in class in less than two weeks. What have I done? Grad school sneaked up and bit me! Gulp.